This aviation magazine article was originally published in the July, 2011 issue of Airplanista Magazine. You can view the original story in our digital aviation magazine here. Among aerobatic pilots entertaining us at air shows around the world, only a tiny handful have earned the reputation to be known as “rock stars” in their field. Mike Goulian is one of those stars. When the announcer says he’s diving the Whelen EXTRA 330SC into “the box” to begin his routine, it’s a call that immediately moves everyone a few steps closer to the flight line, their eyes glued to the sky. 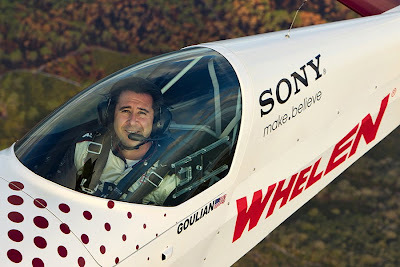 Those who have been lucky enough to have seen Mike Goulian perform an aerobatic routine know his show is always solid, and as far as we mere mortals can tell, the picture of perfection. He commands maximum performance from his airplane, and delivers ridiculously fast snap rolls, inverted maneuvers and other “high G-load” extreme stunts that no human body should be capable of enduring. Yet, we see Goulian do this week after week during air show season. Many of us watching certainly must wonder what is life like for a major-league aerobatic pilot, asking ourselves how they can accomplish such a high stress, physically-demanding routine while making it look so easy. To get inside this story, I asked Goulian to stop rolling his EXTRA 330 long enough to provide the backstory of his life to Airplanista Magazine. After reading his notes, the main point that pops out is what you don’t often think about...the business end of a professional aerobatic team. Without the help of dedicated team members, a long list of loyal sponsors, some hot mechanics and team players, and his wife Karin, Goulian might be kicking back next to you on the flight line watching the other acts. But WOW, what a thrilling 12 minutes they are! 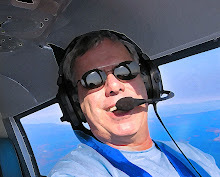 If you have ever gone through IFR training and did a few unusual attitudes sessions, you might have a microscopic idea of the physiological challenges Goulian faces during a routine. To teach unusual attitudes recovery, the CFI made you close your eyes, look in your lap with the hood on while he/she cranks and banks the plane. When asked to look back up, open your eyes and determine from your instruments - quickly - what the plane is doing, that moment of vertigo and uneasiness throws your situational awareness completely out of whack. So multiply that times about a million and you might understand what it’s like inside Goulian’s head when pulling out of yet another series of crazy maneuvers that should have his inner ear crying for mercy. It is here that conditioning is literally the key to survival. To stay in prime shape for this kind of flying, Goulian stays extremely active, knowing that he is every bit an athlete, and his entire body needs to be toned, fit and healthy. On the road, he says, keeping that level of fitness is sometimes a challenge. Anyone who has spent time on the road even for a few days knows it can throw your body clock and mental sharpness into a tailspin. So when you spend nine months on the road and your job is to fly airplanes in dangerous ways, what secrets would you need to employ to be able to put your game face on when it’s time to drop into the box at show center? The main thing to strive for is focus. This life might seem like one not suited for everyone, but for this pilot, there was never any question that aerobatics would be his destiny. “I was sure I would love aerobatic flying before ever stepping into that Bellanca Decathlon in 1984 to try my first roll with my first aerobatic instructor, Donald Dutton. In fact, I was taking aerobatic lessons while still just a student pilot. I do not recommend that today, but I was so intent on getting started flying ‘acro’, that I was training to get my private and training in aerobatics at the same time,” Goulian said. Today, Goulian has about 8,000 hours, holds ATP, SEL & MEL ratings, is type-rated in Lear Jet & Citation 500 series, and owns an A36 Bonanza to fly when not upside-down in the show plane. While the world’s airspace might be his stage and he might be the most visible face of Goulian Aerosports, it takes a tremendous effort all year to keep this show relevant, exciting and financially solvent. As an aerobatics star, we know about Goulian’s job, but personally, he is very much just like everyone watching his act from below. “I am totally blessed to have the greatest family in the world. My wife is so supportive of my flying and our business, and we have a beautiful little four-year-old girl named Emily. She is the light of our life and keeps us on our toes. But when I’m not working, I try and play a lot of golf, and maybe take it a little too seriously for the game to be considered a hobby. I practice like crazy and spend a lot of time with a great coach back in Boston. I guess it’s the Type A in me, but I don’t really want to play golf unless I am competitive in it.” And being competitive is what Mike Goulian is all about. Throughout his season, one show stands out above the rest, and we all know what that is. “AirVenture is the one place where you want to “rock it” each year. So you had better bring your ‘A’ game to EAA,” he said.